The best task management solution. I have been looking for the best way to manage my tasks from day to day. I've used simple apps like Todo, Toodledo, Google Tasks and Todo.txt. I've tried pro-apps like Omnifocus and Pocket Informant. None of which have been the perfect solution for me. The issue I have had is that the pro apps are usually associated with a single operating system. Pocket Informant and Omnifocus both work on iOS and OS X, but neither on Windows. Todo.txt works great but it syncs through cloud services. All of which I can't access from my day job. The other task tools just don't have the functionality that I need. So I guess it's time to start work on a new project. I've actually already got a massive portion of it completed, but it's not quiet ready for use yet. I am working on a new task management app that will run on Windows 7, Windows 8 Desktop, Windows 8 App Store, Windows Phone and hopefully make its way over to iOS, OS X and Android. As work on the project progresses, I'll be posting updates and screenshots on what it does and how it'll work. I have restructured my Evernote several times over the years, addressing shortcomings that I've identified. I'm always trying to find a way to simplify note taking and think I've got a good structure in place. My current layout has a notebook titled .inbox where the bulk of my notes go in to initially. Any note I email, scan or snip goes in to my .inbox notebook. I then process these notes and move them into their appropriate notebooks, tagged accordingly. I keep a register notebook where all of my bill statements and receipts go. I tag each item as either Bill or Receipt so I can differentiate between them. Most of these notes are scanned in, but some of them are emails. Such as an online bill pay confirmation. I keep a Journal 2014 notebook and a Journal Archive. After each year passes, I move the notes from the notebook for that current year into the archive. These notes consist of personal notes I keep that pertain to my life. The biggest organizational issue I have is with clippings. They range from development white papers & code snippets to news articles and paperless blog posts. Trying to figure out how I want to categorize and preserve these clippings has been a bit of a challenge. Tagging can help with a lot of it, but I'm not sure if I want to store them in a single notebook or break them down. They're broken down right now, but I'm not happy with it. I've almost gone to granular with it and need to lump some of my notebooks together. At some point in the future I will need to do a more in depth post on how I capture my content, what apps I use and how my tagging system is set up. One of the most difficult work flows I've had to work out over the last couple of years has been that of photo management. I've had other work flows such as managing tasks that were difficult to implement; mostly because I don't stick to the work flow my self. Photos however has always proved a difficult task to solve. I've come up with a solid solution that works really well. It allows me to have all of my photos & HD videos from my camera to both my Mac and my iPhone. The big plus is it takes zero storage on my phone. You're out with family at a birthday party and take a lot of pictures. You get home and your to tired to pull the photos off, so you postpone it. Before you know it you have 400 photos on your device over several weeks. Then the unthinkable happens - you drop your phone in the sink or loose it at the mall. Photos and videos are now gone. Sure you can retrieve them from iCloud backups, if you have that set up and if you have less than 5gb of photos and videos. What now? You've essentially lost them. Another scenario is one of you doing a great job maintaining your library. Everything is tagged and filed in a very organized manor. The issue is that your library is 200gb and you can't fit that on your device. I don't know about you, but we take nearly 4gb of photos and videos every month. I can't fit that all on my device. Solving the problem requires several things. First, we need to eliminate the need for syncing. The fewer steps needed to back up the photos and provide access from anywhere the better. The second issue that we need to solve for is providing access to all of the content to our devices while we are not at home. Syncing photos can be completely automated across both Windows and OS X. We do this by setting up Photo Stream on our devices and our computers. Photo Stream will automatically sync your full resolution photos to your computer. No need to plug in a cable. While your device can only hold 1,000 compressed and resolution shrunk photos in your Photo Stream, your computer will hold every single photo until you run out of disk space, at full resolution. So this solves the need to sync your phone in order to get them off your device for the most part. The only thing you will still have to plug the phone into the computer for is pulling off the videos. You can always use Dropbox as an intermediate solution for this however, buy letting Dropbox auto-upload the videos you can then just import them into your library easily. Next we need to tackle getting the photos made available to your devices even if you don't have room for them. We can do this with a free Flickr account. Flickr offers users 1TB (1,000GB) of storage for photo's and video. You can upload a maximum photo size of 200MB and a maximum video size of 1GB. The maximum video length is limited to 3 minutes at the time being, so keep that in mind while recording videos. It's best to record them in short pieces. Otherwise you will need to split them up in iMovie or something on your iOS device. The Flickr iOS app has a Auto-Upload feature. Any photo or video you take on your device will be automatically uploaded to a "Auto-Upload" Set (Flickr version of Albums). You can then organize the photo's from your device or from your computer within the web browser however ever you want them to be. Using Photo Stream and Flickr for wireless syncing of your pictures and videos, provides you with a easy method to get your photo's on your computers without any cables and shared on all devices without taking up storage space. I used to maintain my photo's within iPhoto, but have since migrated to Aperture. I'm actually looking at moving to Adobe's Lightroom so I can use it cross-platform on my Windows partition and my OS X partition. I have also used Google's Picasa as well and find that regardless of the software you use to manage your photo library, the following organizational system can be applied to them all. With the above layout, I can easily keep all of my photo's organized in a manor that makes it simple to find pictures in the future. Next I do some tagging, while this isn't as important, it does help when you want to narrow down a specific search criteria. All of my tags are generally for tagging a specific item within the picture. Such as iPhone, Apple, Toyota or Shopping. I don't tag people because I use the Face's feature to include people. While i am fairly lax on my tagging, I am religious about Face tags. Every photo has a face tag. It takes very little time to do it and provides for an excellent way to search for a specific person or group of people. Lastly I don't worry to much about tags for location. Each photo has a GPS location, so there is no need to include a tag for it. Flickr uses different terminology on their website for their methods of photo organization, but for the most part we can easily mimick what we do on our computers. The only thing that we can't do is nest our photo's as deeply as we can on the computer. Flickr provides you with Set's, which essentially acts as a photo album. 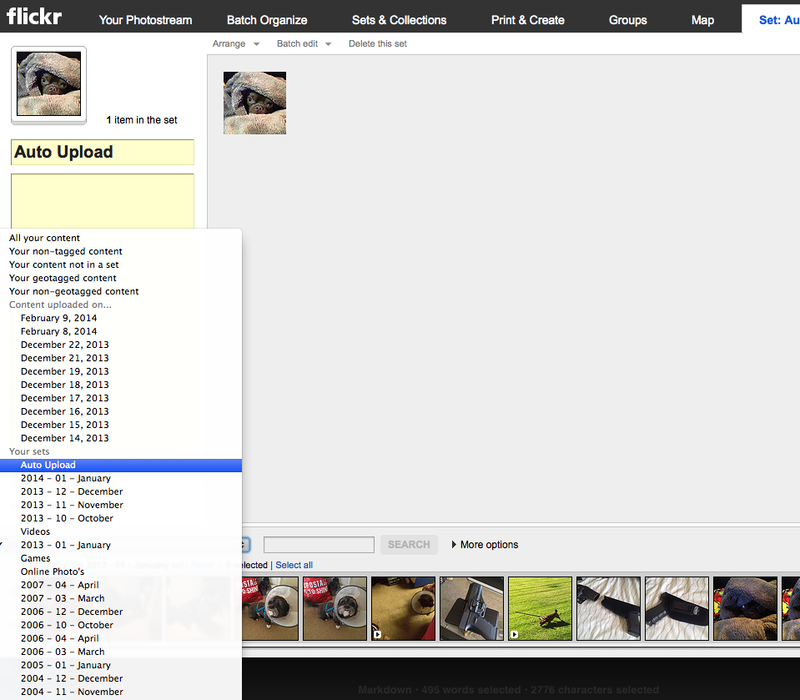 All of your Flickr photo's are stored in your stream and can be added to any number of Sets. If you delete a photo from a set, it still exists in your stream. Sets do nothing more than link to the photo within the stream. Flickr also provides you with Collections. Collections can hold Sets, so I use Collections at the year level, and use Sets at the month level. I dump all of my photo's into their respective month Sets in Flickr and then tag them in the same fashion that I do in Aperture. While Aperture's tags do not apear to transfer into Flickr, some other clients do. I don't remember what i used to manage my photo's in the mid-2000's, but all of the tags that were assigned to them were auto-assigned when I uploaded the pictures to Flickr. The following screenshot show's how I set up my Flickr. Since all of the images can be placed (linked really) into multiple Sets, I place all of my video's into the respective Month Set as well as a Video's Set. Since I can't "Face Tag" people in Flickr, I use Tags here for each individual person. So now when you take a picture on your phone while you are out at dinner you don't have to worry about coming home and performing a sync. Instead, you come home and sit at your computer for about 5 minutes and do some organizing. Opening up your Aperture/iPhoto/Picasa library, you can go to your Photo Stream folder/section on your PC or Mac and see all of your pictures. Import them into your current Month folder, Face Tag and standard Tag them and then log-off. You're done. Opening up your Flickr app you should see that the photo's are already inside of the Auto-Upload Set in your Flickr app. You can then select the photo's and link them into your current Month set, add a couple tags and close the app. Your photo's are properly stored and organized on your computer and online in Flickr. You now have full access to every photo and video you ever take, on all devices from anywhere and never have to plug the phone into your computer to do it again. Lastly, after I import my pictures on the computer from Photo Stream, I delete them from Photo Stream on my computer and from my devices Camera Roll. This ensures that I don't get confused as to what I have already imported in the future and end up with duplicates in my library. Since my photo's are stored on Flickr as well, I don't need to keep them in Photo Stream to view them on my devices. The same thing applies to Flickr. After linking photo's to their Monthly Sets, I remove them from the Auto-Upload Set. I don't think this can be done from the iOS app, so I just do it from Flickr. This can be done by selecting the You option and then click Organize. You select the Auto Upload Set, drag pictures out of the set down to the bottom and save. Your Auto Upload set has been cleared. The entire process, even if you have taken a couple hundred photo's, should only very between 5 minutes and 30 minutes from the time you get home to the time you get off the computer/close the Flickr app. I recently migrated all of my e-mail from Gmail to Outlook.com which was fairly painful. I had to re-organize all of my e-mail into folders in Outlook.com (10's of thousands of e-mails) and it took me nearly a week to get them all imported and re-organized properly. The lesson I learned was that if I want to save an e-mail permanently, perhaps saving it online in the mail server is not the best idea. Saving a copy permanently locally via a Outlook data file or something is not a proper solution for me either. Over the last two years I've moved from Mail.app to Outlook and then to Airmail on my Mac. I also dualboot OS X and Windows 7, so I need something that allows me to maintain access across both platforms. Storing it permanently in my mail client does not resolve that issue. The answer? Store them in 1Password and Evernote. Web-sites that I sign up for, I tend to keep the sign-up confirmation e-mails so that I can go back and check out what sites I am signed up for (sometimes I am bored and can't remember all of the sites I'm registered at. I find nice sites that I had forgetten about this way). Instead of saving these on the server, I can store the login information into 1Password and then just delete the e-mail. That provides me with a record of the web-sites that I am registered at. I can expunge a lot of my archived e-mails just by performing this step. This is probably the most painful to get migrated initially, but it also provides a great cross-platform solution to store my e-mails. The e-mails that I want to save I will just forward into my Evernote accounts e-mail address. Saving my current archive isn't to big of an issue compared to maintaining it though. I am thuroughly surprised at how horrible rule systems are on the mail services. Gmail doesn't appear to have any kind of rules other than just auto-filing. Outlook supports auto-forwarding, but it is serverely gimped. I can only forward an e-mail to a specific e-mail address, without being able to edit the header or body. It would be really nice to tell Outlook.com to auto-forward all e-mails from my Dad to my Evernote e-mail address. I could append to the subject the notebook that I want to store it in (E-mail archive) and then apply a tag called "Dad". This would let me go into Evernote and select my E-mail Archive notebook, filter by my Dad tag and instantly see all of the e-mails my dad has sent me. Unfortunately, I can't do that just yet. Outlook.com's auto-forwarding system is to weak and doesn't have decent options. I looked into my current mail client, Airmail and can't find any auto-forwarding rules within it either. Apple's Mail.app does do forwarding, but it does not let you append content to the subject line of the e-mail it forwards. You can only pre-append text to the message body which does me no good. So I guess the next step in order to get this working is to dig in and learn some Apple Script. My goal was to find a solution that was not ran locally on my machine. Local solutions requires the machine to be online all the time. I wanted a cloud based solution but have yet to find one. I have used Gmail for years, it has always been the best of the major email services out there. It had the best search, a great filter system and it was fast. Times have changed though. It's search doesn't work like I expect it to. I've searched for several product licenses that I know exist in my Gmail, but can't find them. I know they exist; I migrated my email over to Outlook today and found them instantly. It's forced me to use apps like Evernote and 1Password to save that information. Gmail's filtering is to complicated. I know it's powerful, but I find myself searching google for how to perform a specific filter because I can't figure it out. I tend to get frustrated and move on without finding what I was hunting for. Google uses a label system that's very confusing. I can apply a label called "Work to an email and then move it into the same "Work" label like it's a folder. I understand that they do it for flexibility in filing; make it easier to store the same email in more than one location in your inbox, but it's really annoying and frustrating when you have thousands of email messages and you still can't find what you're looking for. I know some people will think I don't know how to file properly, and maybe that's true. If it is, come and show me how to properly organize 10,000+ emails with labels and then dig through the emails associated with a label or two to find the content you need. It's not easy. I also don't like the whole `archiving` and `all mail` thing. When I delete a message, I want it deleted. If you want to _"archive"_ it then fine, but don't include it in the stupid `all mail` folder. I deleted it so I don't see it again. I apply labels to things I want archived. Archiving every single piece of email that I receive is just stupid. Lastly, Google had Google Apps Standard; a free service for those that wanted to use a custom domain and have access to some of their Google Apps items. In December of 2012 they removed it. Just like a lot of other great things they've removed. I want a personal domain associated with my gmail without having to provide people my gmail account and I don't want to deal with mail forwarding. To be honest I was a big angry that they got rid of that feature unless you are a business and pay for it. I have no problem paying the $5 a month for the Business Google Apps except that I already pay it for my business and and don't want to setup an account using a _"fake"_ business just to use it personally. On top of that, their UI and service features hasn't changed much, with the exception of how they scan my emails and deliver targeted ads. That's improved. So I gave up. It's time to pack up all of my email and move on. Let's be honest, Hotmail and Live sucked. Really bad. It was full of spam and my hotmail account was hacked like 4 times. However, just like Google, things have changed with time. For Outlook it seems to be for the better. The first thing I did was use a feature that I was not aware that Microsoft offered. The ability to use your own custom domain with a Outlook.com email address. This worked really nice! Not only was the process extremely easy to set up, Microsoft provides my custom domain with 50 free email addresses that I can use. This really helps me out, as now I can have my personal email address as something related to sullinger.us and I can have a support email address at support@sullinger.us. The nice part here is that I get the same thing that Google Apps Standard was offering when it was free, prior to them going business only. The next thing I did was import all if my Gmail email into it. The import process took a lot of time. By the time of this writing, it had been importing for roughly 6 hours. Luckily, this is a server side process; I don't have to sit and not close my browser. I closed my browser and let it import. I have a ton of Gmail emails, so this is to be expected. The sweep feature of Outlook.com is really nice and I can see it really improving my ability to get to inbox zero. I can select an email and tell Outlook.com to move all emails from this sender to a specific folder, delete all emails from this sender, schedule a clean up or create a rule from this email. Using the sweep feature, I was able to re-organize about 1,500 email messages imported from Google (it's still importing) in under an hour. It's really impressive how productive one can be with a tool like this. The last thing that I really like about Outlook.com is that it uses the Exchange ActiveSync server for clients to connect with. This means that I actually get real push on my iOS devices. Something I do not get with Google. Instead, I have to pull new mail down the from server every so many minutes (chosen) or manually. It's annoying. Migrating from email services can be a real pain. I'm currently focusing on just migrating from Gmail for the time being. However, once the import process is completed, the emails are organized and I have refreshed the sites I visit that use my Gmail email, I will probably start the import process on iCloud. I like iCloud as a service, but it lacks way to much functionality to be a good email service. I really like having my contacts in iCloud, along with my calendars and tasks. Unfortunately, Microsoft and Apple haven't worked together to get iCloud to work on OS X's version of Office 2011. So I have to decide if I want to move my contacts and calendars to Outlook.com as well or just leave them in iCloud. Moving my email to Outlook has made it a pain to email contacts, as I can't get my contacts from the OS X Contacts app over to Outlook 2011, up to Outlook.com. I don't want to sync my tasks with Outlook.com because then I would loose the ability to use Siri. So it's not a perfect solution just yet. Odds are I will migrate my contacts and calendars to Outlook.com, but I haven't 100% decided yet.